What interests a bioinformatician who considers himself to be an ‘evolutionary biologist at heart’? Dr Rich Edwards discusses his current research project that includes getting close and personal with virus hijackers. Rich Edwards is a Senior Lecturer in the School of Biotechnology and Biomolecular Sciences (BABS) at the University of New South Wales and Associate Professor in the Centre for Biological Sciences at the University of Southampton. Originally from southern England, Rich trained as a geneticist at the University of Nottingham before moving to Dublin, Ireland to become a full time bioinformatician in 2001. Rich established his own research group in 2007 following a move to Southampton, and moved to UNSW for his current post in late 2013. 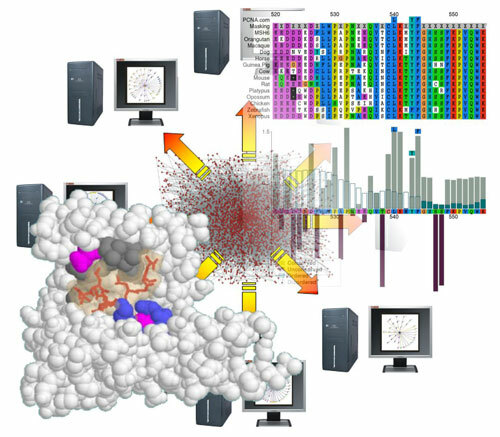 The core research activity in the lab is the analysis and prediction of protein-protein interactions. The lab also has a number of interdisciplinary collaborative projects applying bioinformatics tools and molecular evolution theory to experimental biology, often using large genomic, transcriptomic and/or proteomic datasets. More details can be found at: http://edwardslab.blogspot.com.au/ or http://www.babs.unsw.edu.au/staff_academic/dr-richard-edwards.